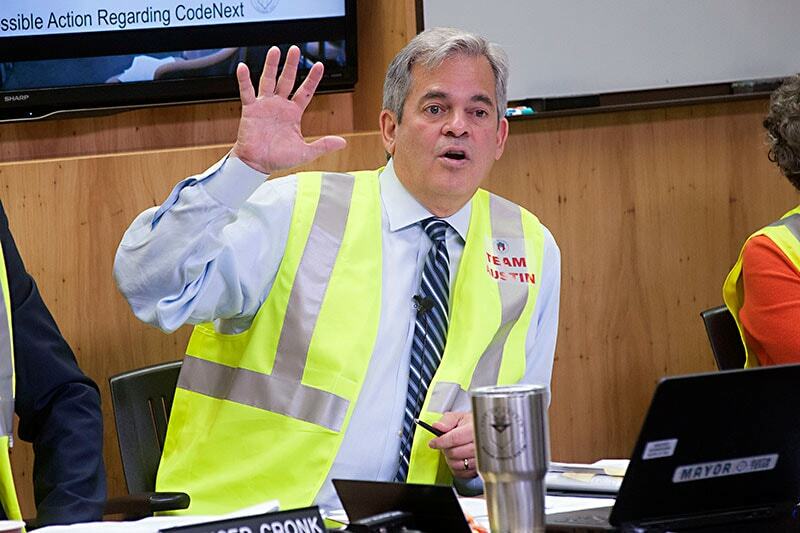 Only a week has passed since City Council started on CodeNEXT, but a lot can happen in a week. Despite efforts to find consensus, it didn't take long for the Preserve vs. Dens­i­fy divide to manifest. Mayor Steve Adler couldn't even ask "What is our income-restricted housing goal and what capacity is needed to reach that goal?" without getting two types of answers. Austin's Strategic Housing Blueprint, adopted last year, stipulates that 135,000 homes, 60,000 of which are affordable units, are needed in the next 10 years. But several CMs, most vocally Leslie Pool and Alison Alter, were opposed to the idea that housing capacity should be two times the production goal of 135,000. Adler said he believes some CMs are "scared" of what such a statement means "down the road" – densifying the city's core. After more than an hour, all but Pool agreed: CodeNEXT should allow for overall housing production to reach 135,000 units, so capacity must be greater than 135,000. Stephen Oliver presided over his final Planning Commission meeting on Tuesday night. He commended his colleagues for their hard work and ability to achieve compromise. He applauded commissioners for maintaining a diversity of opinions and said "it's not a mistake that we are comprised the way we are," a subtle reference to the recent uproar over the PC's makeup. He also recommended that the PC merge with the Zoning and Platting Commission to ease public confusion, noting the "range of opinions should be represented by one body." In a surprising turn, commissioners voted 7-5 for Secretary James Shieh to succeed Oliver, besting Vice Chair Fayez Kazi. They'll elect a new secretary on June 26. Meanwhile, the four ZAP commissioners who voted against that body's recommendation to terminate CodeNEXT released a minority report, expressing their disapproval of the recommendation, calling it "unwarranted, unproductive, and recalcitrant." Commissioner Abigail Tatkow told me the point of the report is to let the community know that, despite ZAP's recommendation, "there was still support of the process." A hearing date has been set for the land use petition case. Judge Orlinda Naranjo will hear legal arguments only on Wednesday, June 27, in the 419th Civil District Court. Fred Lewis, the co-author of the referendum petition that seeks to put the rewrite to a public vote instead of trusting City Council with its fate, filed the lawsuit on June 1, and the city anticipated the suit following Coun­cil's 6-4 vote to not put the item on the Novem­ber ballot. Some council members believe the petition orders an illegal task; they argue Texas only allows two zoning issues to be put to a public vote: whether a city should enact or remove zoning. Now a judge can decide. Lewis and fellow plaintiff Bill Bunch will represent petition signers, while local law firm Scott, Douglass & McConnico will represent the city. Photo and article were originally taken, published and written by The Austin Chronicle. Photo was taken by John Anderson. Read the full article here. Sign-up for our newsletter to stay up-to-date on all things Austin and real estate!